As promised this is the reception area of the executive office I recently completed. If you haven't seen the executive office before & after, I suggest you take a look at that now. BEFORE: This is the front entry of the office. Imagine clients walking in- straight into the reception desk and all this file storage. AFTER: This is the front entry now. 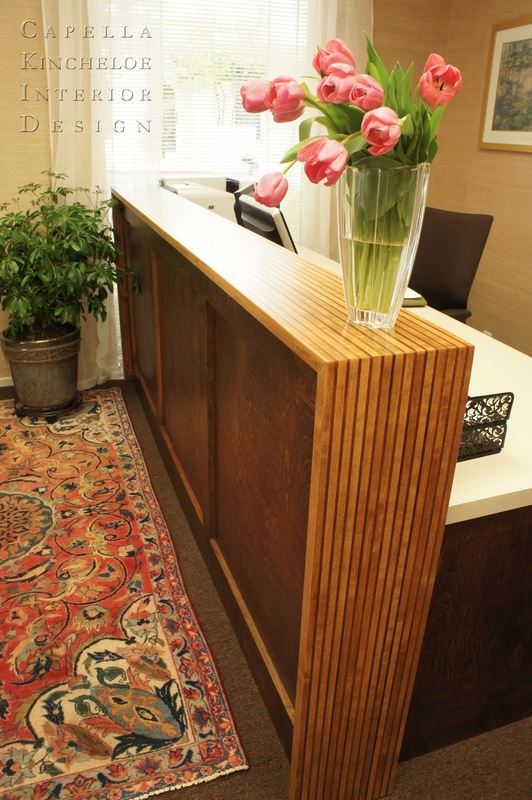 Clients walk-in and are welcomed with this beautiful custom reception desk and a cozy guest chairs. This layout makes more sense for the flow of the office, as the waiting clients are separated from the main office by the reception desk. BEFORE: The reception chairs used to sit where the reception desk is now. This caused the clients to walk by the reception desk and potentially sensitive information, to see directly in the main office, and then face the front door. AFTER: Now this is what clients see when they walk in. This desk was custom designed by me and the master carpenter created this masterpiece. It has a wonderful waterfall top with two types of hardwood pressed together. AFTER: Here is a more detailed view of the waterfall top. While you can't see in these images, the top actually floats about an 1" around the rest of the desk for a lighter feel. 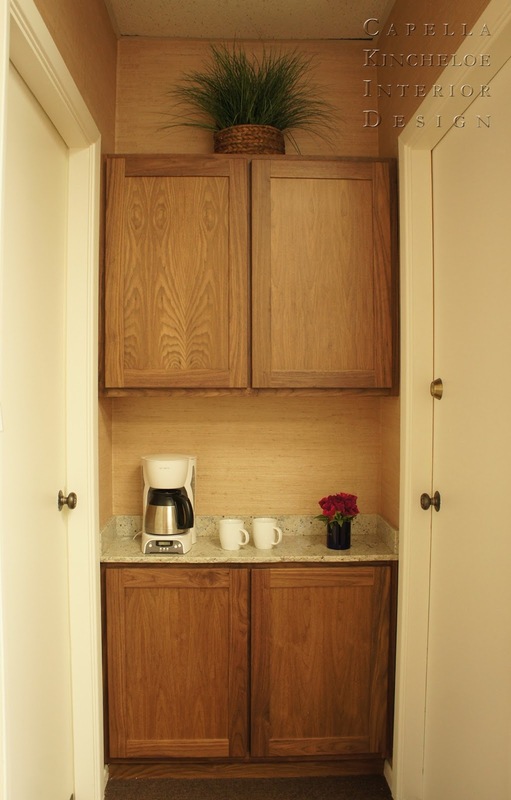 BEFORE: You can see that this beverage center does not work and is not a good use of space. The office needed more storage. This is an interior design project I recently wrapped up for a financial planner's office here in Phoenix. After years of built-up clutter, she desired more organization and a more professional-looking office. She didn't want the office to feel too corporate and still be welcoming to her clients. 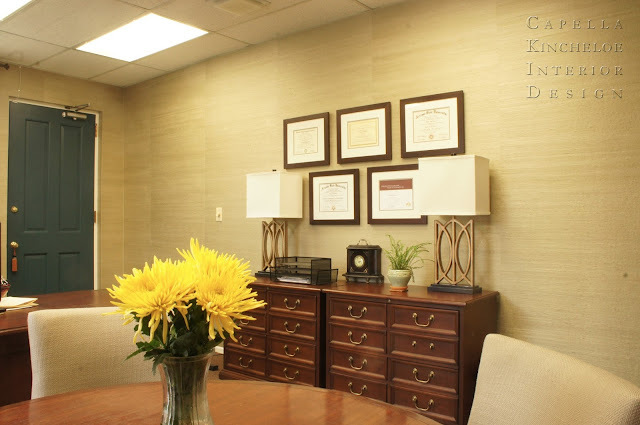 Since she wanted to keep much of her existing furniture, we focused on items that would make the most impact (the grasscloth wallpaper) and eliminating items that were erroneous in the office. We tried very hard to change the 30-year-old drop ceiling tiles, but the landlord was not on-board. 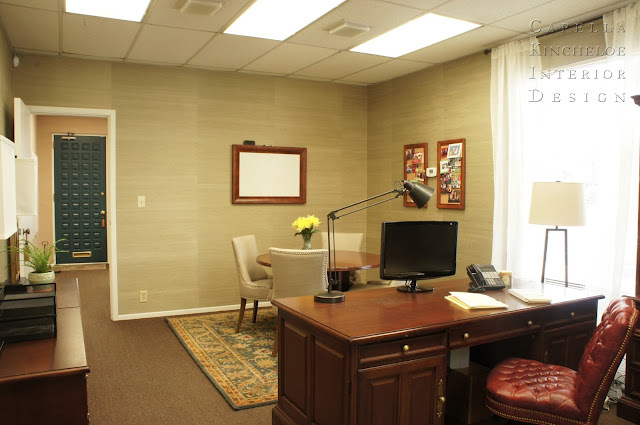 AFTER: The wallpaper softens the industrial-ness of the office and give texture more than paint. The conference table is the same, but we brought in linen covered chairs to lighten and bring in feminine lines. The chaos of the cards and photos is now contained in two framed bulletin boards. AFTER: I had the certificates reframed to give them more importance and be a cohesive grouping. The two lamps add height to this side of the room and the fluorescent overhead lights can be turned off and still have light. 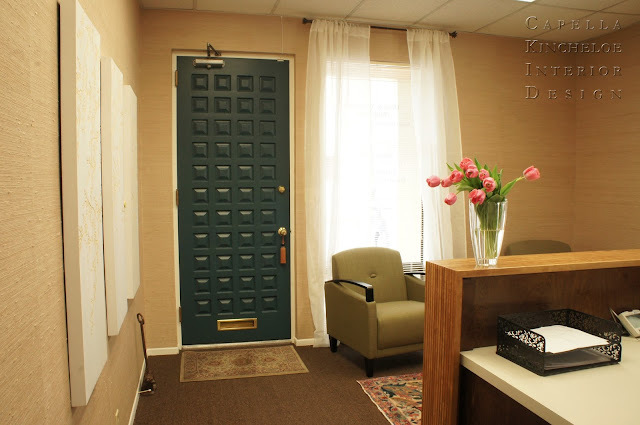 AFTER: This is the first thing that clients now see walking into this office. The doors were painted to show them off and add color. The new rug defines the client area and plays on the door color while covering the industrial carpet. 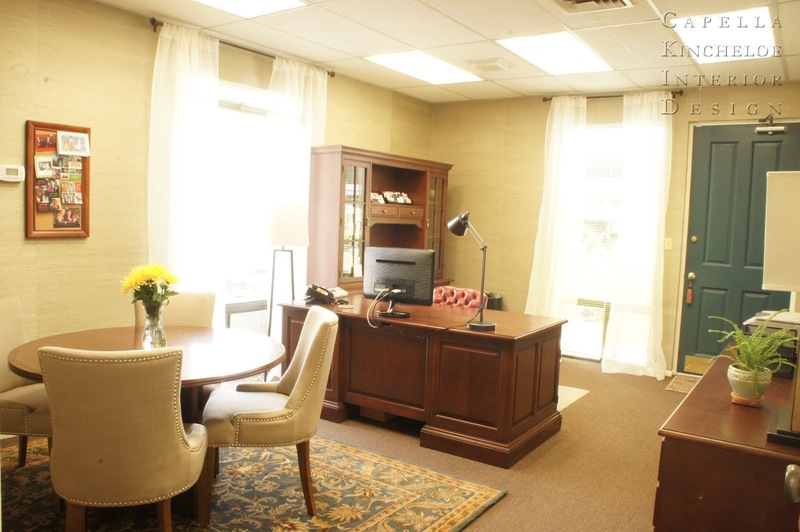 The curtains soften the room and are a nice counter-point to the dark heavy office furniture. 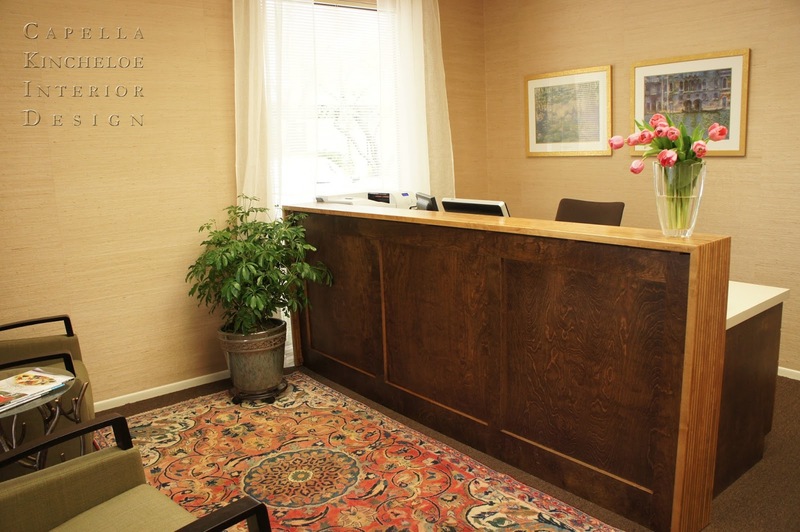 Next week, I will share the reception area of this office, the transformation is even more astonishing than this office. I designed this bath two years ago for the Atlanta Homes and Lifestyles Christmas Showhouse. I was lucky enough at the time to work with the talented Tina Steele Lindsey to create the custom painting you see. You can also see more of this bathroom and the others here. Everyone loves a good before and after. I completed this project and had it published in Jezebel Magazine in February. This is right after we brought the table and the pillows back from Scotts - so imagine without the table or pillows for true "before". Jeff Wolk took all the after photos.